In a recirculating system the drainage water doesn't flow away but is reused. 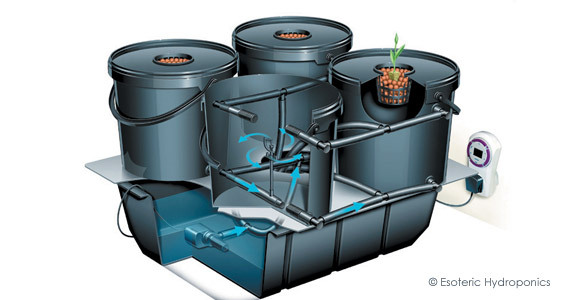 There are a few different kinds of recirculating systems: Nutrient Flow Technique (NFT), aeroponics, ebb and flood systems and drip systems. The first NFT (Nutrient Flow Technique) systems were introduced in the seventies. Allen Cooper developed the first NFT system in England. 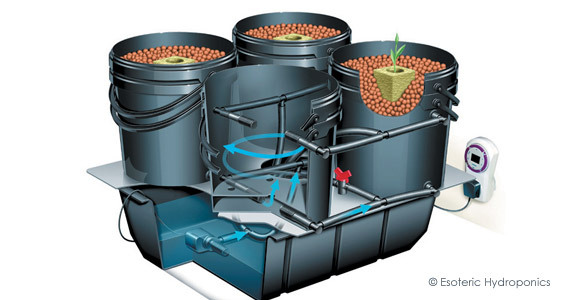 In NFT systems a series of tubes provide a constant, gentle flow of nutrient solution to the roots. The nutrient solution that drains from the root environment is gathered in a reservoir and then recirculated to the plants. In recent times, the NFT tables have also become very popular for cultivation in this manner. This approach works on the same principle as the first tube system developed. To ensure that the nutrient solution has sufficient flow the tubing itself must have a fall of around 1%. In a tunnel construction the flow rate should be around 1litre per minute. Take care to ensure that the root mass at the bottom of the tunnel doesn’t become too dense! If this occurs there is the danger that the nutrient solution will flow over the outer layer of roots, so that there is not enough contact between the nutrient solution and the roots inside the root mass. Under these circumstances the plants will wilt more quickly and nutrient deficiencies may arise. In order to prevent such a thick root mass from developing it is advisable to make sure that the tubes are no more than 30 feet in length and that they have a diameter of at least 12 inches. An imminent nutrient deficiency in a NFT system will often be seen first on the plants at the end of the flow (the lowest plants). This is because the plants at the beginning and middle of the flow are still able to extract nutrition from the nutrient solution. By keeping an extra close eye on these plants, nutrient shortages can be spotted and corrected, sooner. Correction is achieved by increasing the flow rate and/ or increasing the strength (EC) of the solution. As well as nutrient deficiencies, oxygen shortages are often the first problems seen with the plants at the end of the flow. A shortage of oxygen will cause the roots to turn brown with a corresponding drop in the plants uptake of water and nutrients. The chances of oxygen shortages arising are greatest during the fruit-forming phase and in other stressful situations. Using enzymes that stimulate root decomposition leads to fewer dead roots remaining and a more vibrant plant. Under normal circumstances there will always be a certain amount of dead root material in the system, but, so long as there are enough white, healthy roots, this is no reason for panic. Aeroponics was introduced in 1982, a few years after the NFT system came the Aeroponic system; it originally comes from Israel. Aeroponics is a system in which misters are used to continuously bathe the roots in very fine droplets of water or nutrient solution. The smaller the droplets are, the better is the contact between the nutrient solution and the roots, and the better is the uptake of food and water. Given that, practically speaking, the roots are growing in air; they always have sufficient oxygen available and large yields become possible. The biggest disadvantages off aeroponic systems are the relatively high initial investment costs and the systems’ proneness to malfunction. Leaving a thin layer of water on the bottom of the misting room will ensure that plants don’t go without water if there should be a system failure. 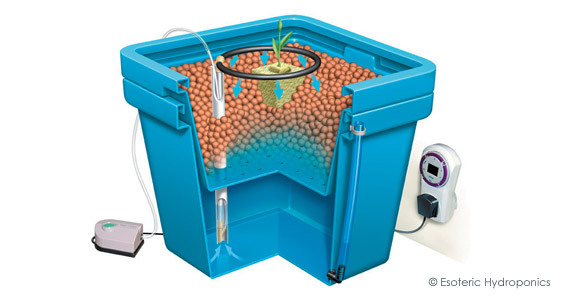 In an ebb and flood system, the plants are placed in a box that is periodically pumped full of nutrient solution. The substrate soaks up the nutrient solution, which is then pumped away. By filling the box with nutrient solution the old air is pushed out as the solution is pumped away and fresh air flows into the medium. In order to prevent oxygen shortages from occurring around the roots, the medium must not be saturated for too long with water and it must contain sufficient air when the nutrient solution has drained away. One guideline for this is to ensure that the process of pumping full and then emptying should take no longer than 30 minutes. The recommended frequency for flooding depends on the substrate that is being used and each plant’s root volume. Clay Pebbles retain little water and must be flooded more often than a system with rock wool, for example, which will hold more water. Drip systems are perhaps the most common type of hydroponic systems in the world, owing to their simplicity. A clock controls a pump in the nutrient tank. When the clock switches on, the pump and a small drip mechanism drips a nutrient solution over the base of each plant. The excess nutrient solution is caught in the nutrient reservoir for subsequent reuse, or drained away. In this system, the plants are kept in an inert substrate. 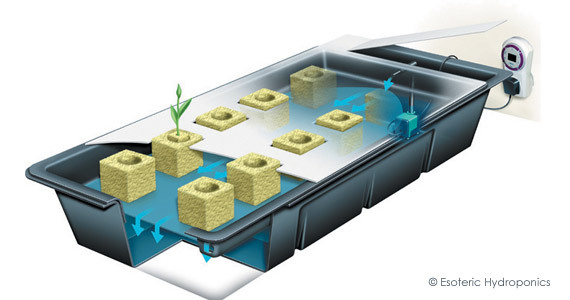 As with the ebb and flood system, the watering frequency is different based on the substrate used and the root volume.